The first stop on our way to my parents was actually meeting them for lunch. My parents really wanted to meet with my dad’s cousin who is looking for a lake house somewhere here in West Michigan so they could ask some questions and meet L for the first time. The best meeting place for the three groups was somewhere in the Kankakee, IL Metro area. Growing up, this was the closest “Big City” and it was about a half hour away. By closest big city, I mean the closest Blockbuster, the closest Walmart, and, yes, even the closest McDonalds. I lived pretty much in the country. The restaurant chosen was a new restaurant in an established location. Right at the very busy intersection of Armour Road and IL-50 in Bourbonnais is a bar that has been around forever. I remember it as Jailhouse Rock. Most recently it was Vito’s Pizza. 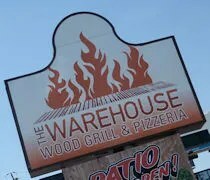 Now, it’s known as The Warehouse Wood Grill & Pizzeria. None of us had actually been in the restaurant before under any of the previous incarnations. My parents had heard the pizza at The Warehouse was really good and they had a lunch buffet which is what led to the selection for lunch. J and I were a little wait so the other four were waiting for us in the outdoor waiting area. I’m not really sure why they didn’t just go in, but when we pulled in to the parking lot, they were all outside. After getting L out of the car and saying hi to everyone, we headed inside where a hostess took us to a long table in the very back of the restaurant. The first thing we all noticed was the size of the place. It’s huge. 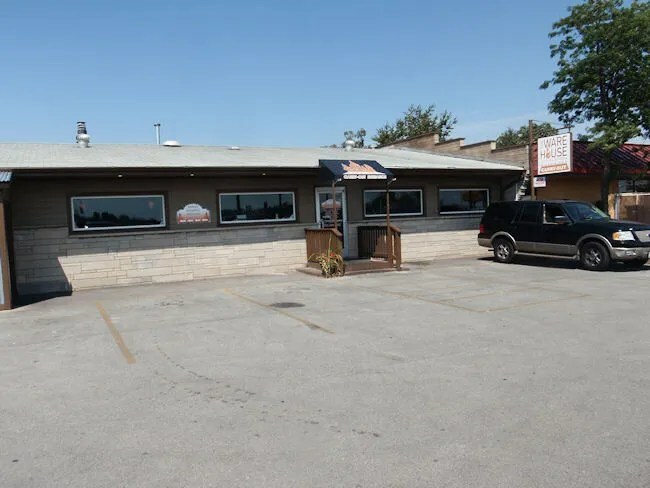 It doesn’t look that big from the road, but there’s a large bar as well as two pretty good sized dining rooms. The hostess got a high chair for J while we all sort of looked over the menus. In reality, we really just needed the drink portion of the menu because we were all going for the buffet. I ordered a 312 and had to explain to the waitress that that was a beer. They had it on draft, so I got a 16 oz. Everyone else ordered pops except for the one Miller Lite. My dad’s cousin’s husband just had the beer and no food. The rest of us headed to the buffet to load. The spread consisted of salad, pasta, fried chicken, and pizza. Everything looked delicious…even the salad…but I passed on that and went for the chicken first. 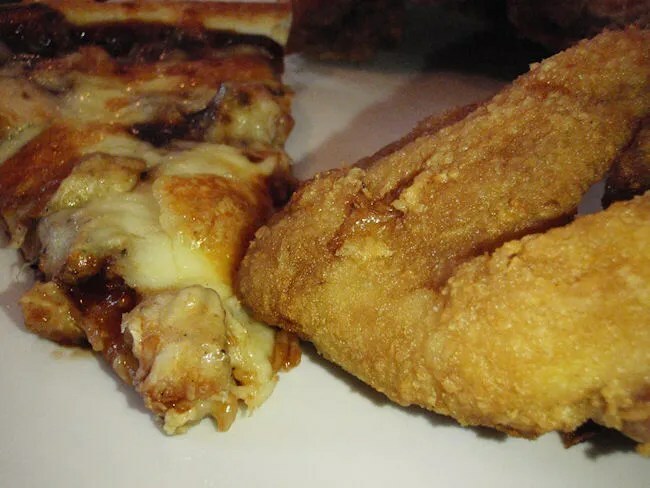 I pulled a wing and a breast out of the ban then added a bread stick before heading to the pizza. 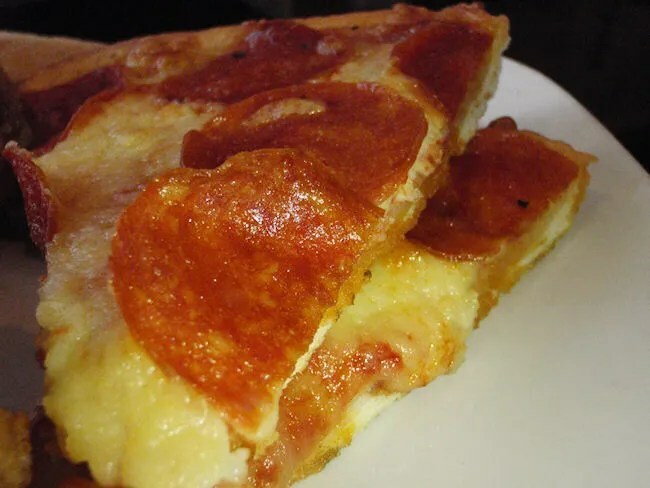 On my first trip, I grabbed two slices. One was just pepperoni. The other was a BBQ chicken. I ate the chicken first because L was close enough to me that she was reaching on to my plate and ripping the skin off the chicken and trying to eat it. Have I mentioned that she’s only seven months old!? It’s like she already has a sixth sense on what good food is. The chicken was delicious. The white meat was very juicy and the breading was nice and crispy. My dad said the dark meat was a little dry which seems odd because the white meat was dead on perfect. The pizza is probably the best I’ve had in the Kankakee area. The crust must be loaded with butter because it has a creamy, flaky texture yet maintains a pretty good crunch. The BBQ chicken slices was by far the best. J and I both went for seconds on that slice. The bill for the six of us was right around sixty bucks. Bourbonnais’ big claim to fame is being the summer home of the Chicago Bears. Their training camp is right down the road at Olivet Nazarene University. I know in the past, a lot of Bears personnel had visited the previous incarnations in this building. I would hope they really gave The Warehouse a lot of business this past summer. We were all pretty impressed with the place and enjoyed a great lunch. My parents are usually chain restaurant people, but this place really hit the spot with them and I wouldn’t be surprised to hear they’ve been back.